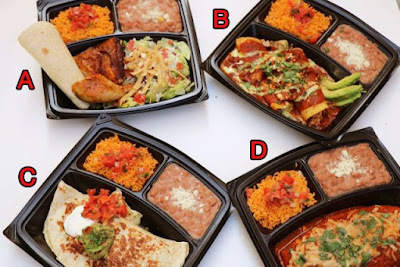 El Pollo Loco's latest is a line of new, limited-time Authentic Platters. The menu features four entrees, each accompanied by a side of rice and beans. - Two-piece Chicken and Salad - Two pieces of flame-grilled chicken, tortillas, and a salad topped with cotija cheese, tortilla strips, creamy cilantro dressing, and pico de gallo. - Double Chicken Enchilada - Two enchiladas filled with shredded ranchero chicken and cheese, topped with chicken, avocado, Monterey Jack cheese, enchilada sauce, cotija cheese, cilantro, and creamy cilantro dressing. - Wet Burrito - A flour tortilla wrapped around a filling of chicken, cheese, rice, cabbage, and pico de gallo, topped with enchilada sauce, Monterey Jack cheese, and cilantro.